i love halloween! i can’t wait till the kids come home with all their goodies! yummy yummy! chocolate, lollypops, licorice, all sorts of sugary stuff. and they share it all with me! i don’t know why we give all that candy away when kids come to our door. they scare me half to death, and they have bags that are already full, and i have an empty tummy that needs filling. i’ll just go hide under my comfy pillow and wait. 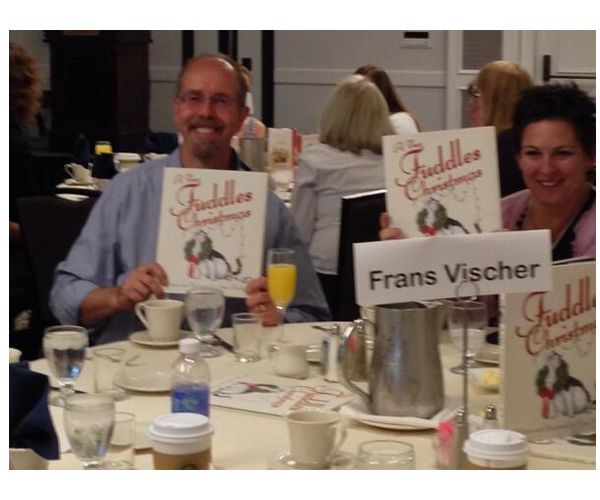 frans was invited to the So Cal Indie Bookstore Association’s educator’s brunch in del mar on sunday. he met lots of book-lovers; teachers and librarians and bookstore owners and other authors and all they talked about was books. 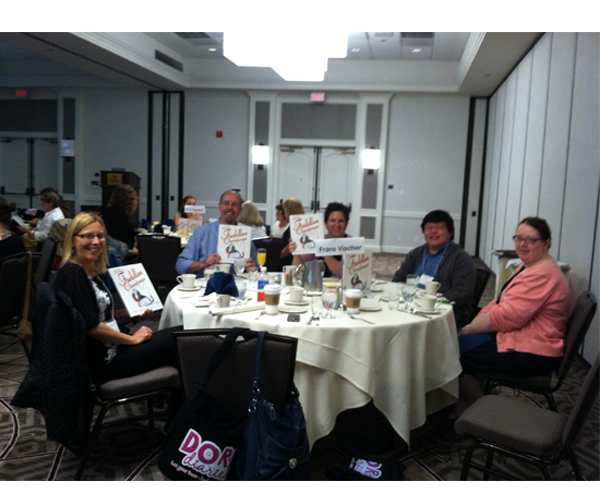 i wouldn’t have had time to talk about books- not with all that food around. brunch is for eating, and that’s what i would’ve been doing the whole time! 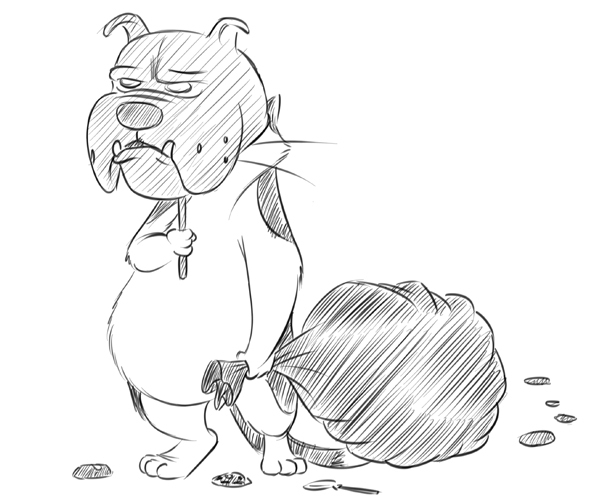 i can just imagine the bagels with salmon and cream cheese and scrambled eggs and bacon and sausages and … oh no! now i’m getting myself all hungry, and dinner time is almost an hour away! 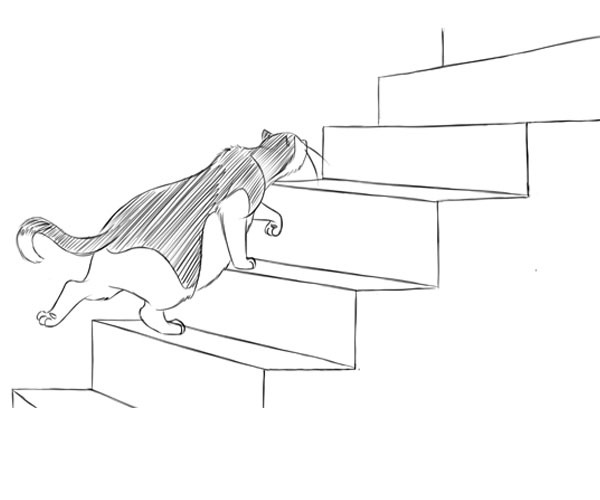 a cat’s eternal struggle pulling his weight up the mountainous stairs to reach the soft bed that awaits his daily catnap. Frans’ November Bay Area book-tour! 8 am-noon, Guadalupe elementary school. whew! glad just seeing all that makes me want to take a long catnap! wake me when it’s dinner time. or maybe he’s pondering dinner. that’s what i’d be doing. i do my best thinking that way. lasagna, shrimp linguini, sushi, or cobb salad, or a juicy shark steak sandwich! oh, my head is swirling- it’s too much to ponder! i should read something to clear my mind. maybe the cat in the hat! 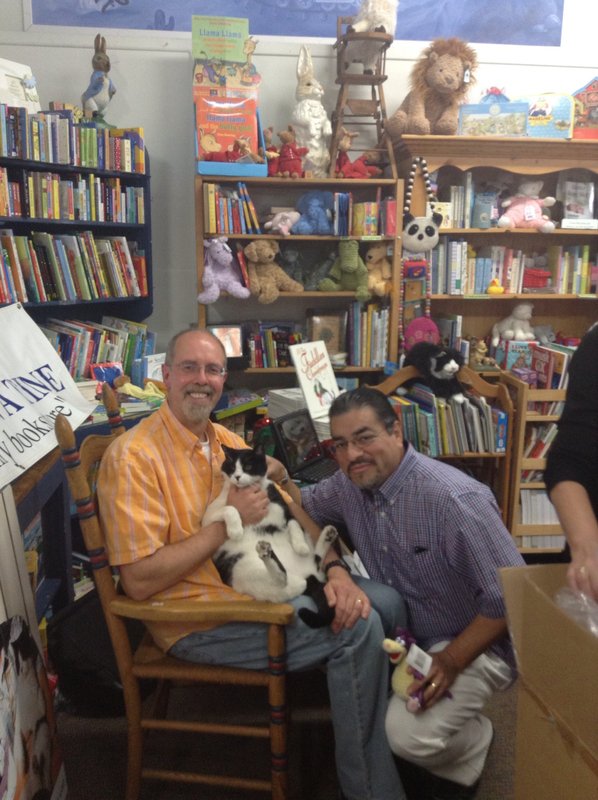 on sunday frans visited once upon a time in montrose, his neighborhood bookstore for a really fun book-signing. 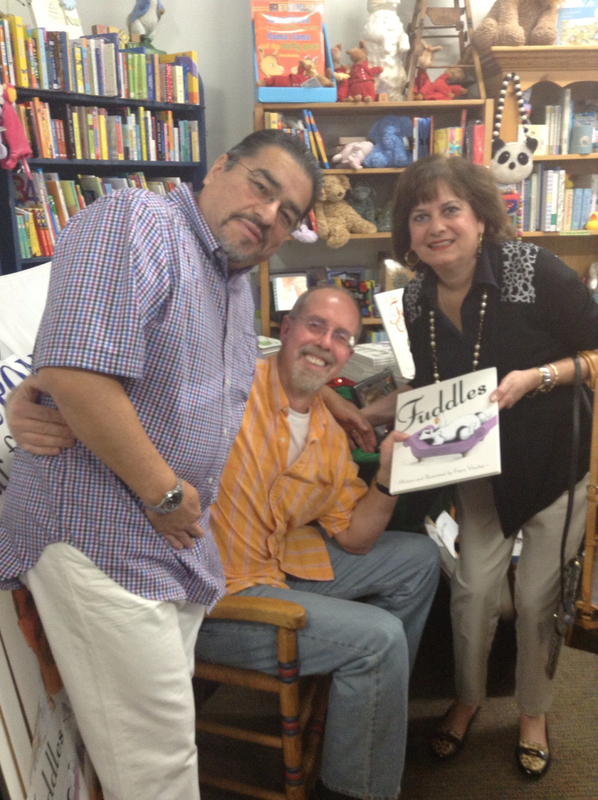 friends and strangers stopped by as frans did a fuddles drawing in each book sold. he was a busy guy! 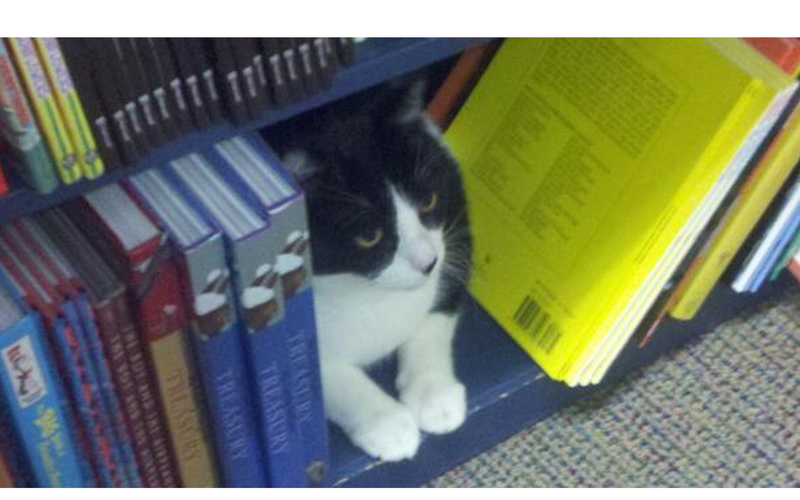 and his real cat was there, exploring the nooks and crannies of the store while the kids played with him. and speaking of exploring, i want to investigate a fresh pasta cannelloni with sweet italian sausage and diced onions and minced garlic and crushed tomatoes and skimmed ricotta and mozzarella and peas and eggs and some nutmeg! boy, that’s a mouthful! and i can’t wait to get my mouth full! 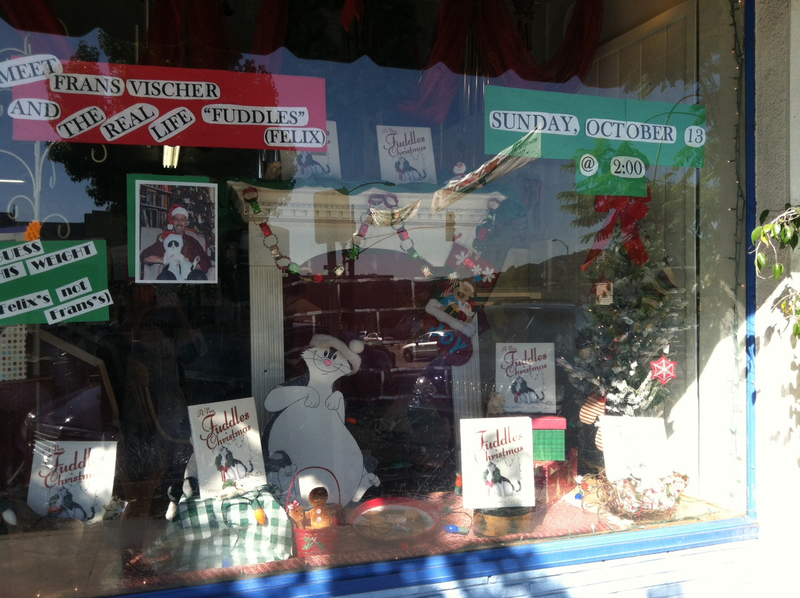 Fuddles Once Upon A Time bookstore visit! yay! my first local bookstore visit is this sunday, october 13th, 2 pm at Once Upon A Time, in Montrose, CA, the country’s oldest children’s bookstore! frans’ real cat, the inspiration for fuddles will be there. we’ll have a “guess the cat’s weight” contest, and all the kids, (or adults,) can get their picture taken with frans and his cat. frans will draw pictures for everyone, and we may have a little writing session too, and lots of activities! so come on out for all the fun! aaaaahh, nothing like a little luxury, (except a lot of luxury!) 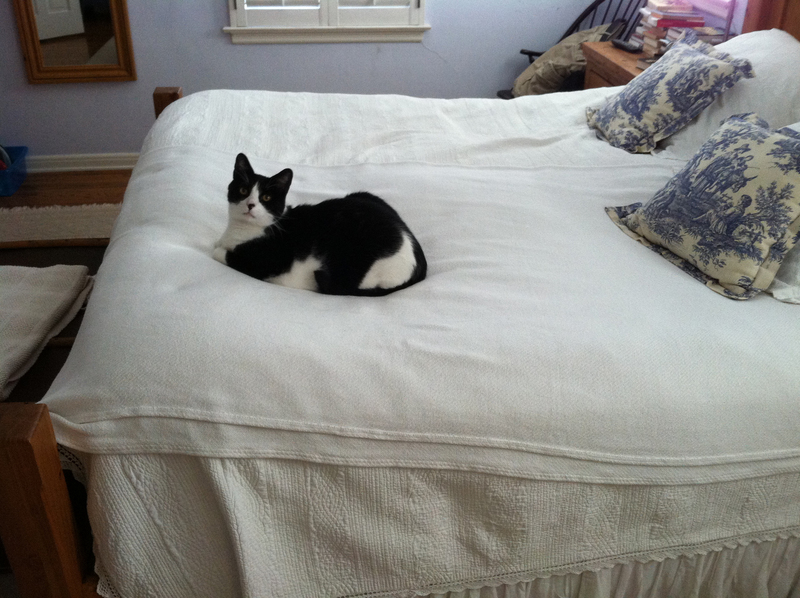 spreading out on a big bed. 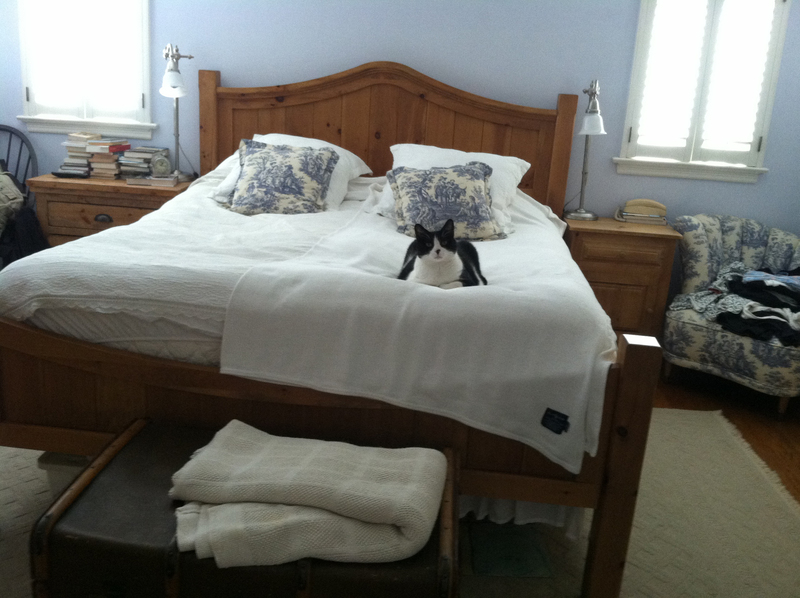 i have my own pillow to sleep on, but i can roll around on a big bed and stretch my legs. all i need is some fresh warm laundry to lie in, right out of the dryer. now that would be tops! especially when i’m about to gorge myself on a grilled double beef chili cheese burger with bacon and mayo and a tomato and pickles! 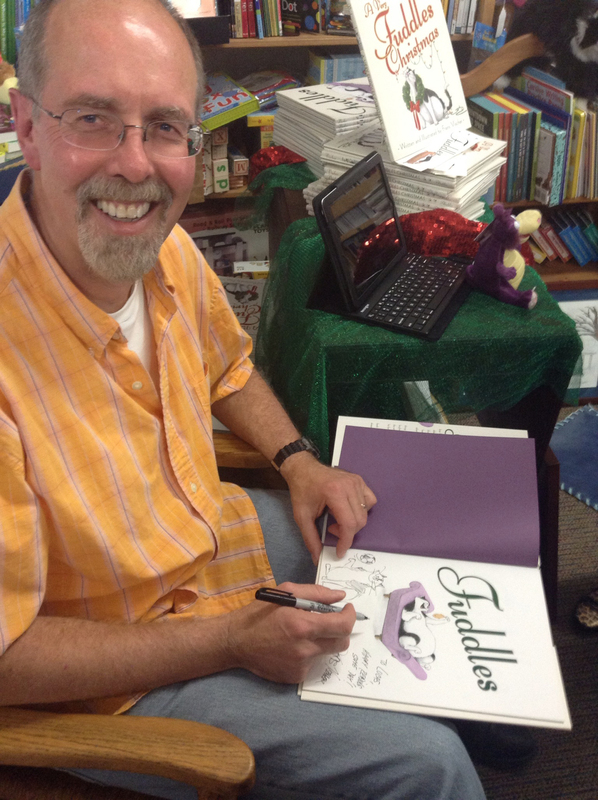 The first Fuddles Christmas book-signing! yay! come and see frans this sunday! bring your kids and the whole family, and get your own fuddles copy! 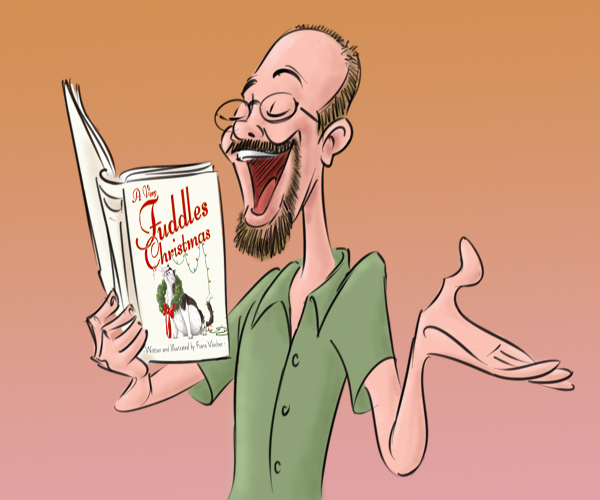 A Very Fuddles Christmas is here! 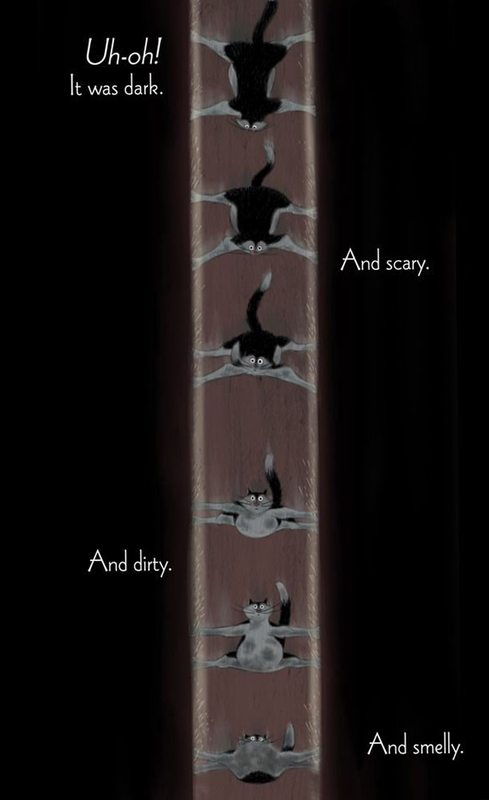 here i am, sliding down the chimney, getting my beautiful fur coat all dirty! just one of the adventures i have in my new book. and it’s out today, at last, coming to bookstores! yay! 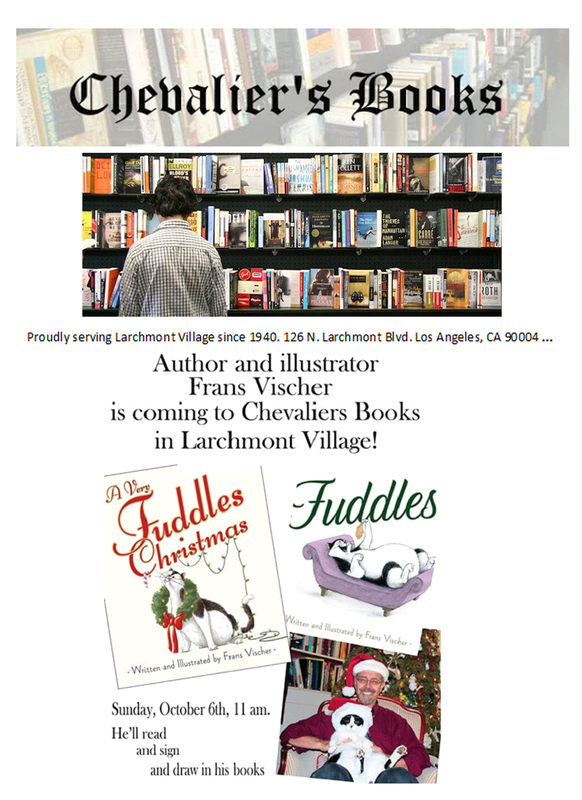 frans is doing lots of book-signings and school visits between now and christmas, so look out when he comes to your neighborhood! i’m going to celebrate by having a great big tuna-melt sandwich with swiss cheese and relish and a sweet pickle. and then i’ll take a big nap!